Social psychology attempts to understand, explain, predict and, when needed, change people's thoughts, feelings and behaviours. For a relatively young discipline it has already made great strides toward this awe-inspiring goal. Pioneers such as Lewin, Asch, Kelley and Festinger began groundwork in the 1940s and 1950s, but it was only in the late 1960s that social psychology came of age. Since then it has blossomed, both in investigating the basics of the discipline and in applying the insights from fundamental social psychology to different fields related to the area. This volume is devoted to the development of understanding in the field of social psychology over the last four decades, focusing on both basic and applied social psychology. Contributions are gathered under five main areas: attitudes and attitude change; social cognition and emotions; interpersonal and group processes; health behavior; and bereavement and coping. These five domains not only illustrate the scope of social psychology, but also pay tribute to one of the key figures in modern social psychology, Wolfgang Stroebe. Remarkably, he has made significant contributions across all five of these areas, and his research achievements exemplify the progress, prospects and problems faced by modern social psychology over the last 40 years. This volume includes contributions from some of the most distinguished names in the field, and all authors provide an overview or critical look at their specific area of expertise, tracing historical developments where appropriate. 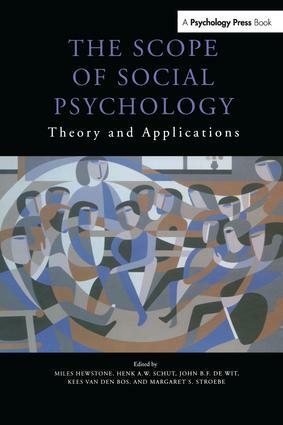 The Scope of Social Psychology provides a broad-ranging, illustrative review of the field of modern social psychology.